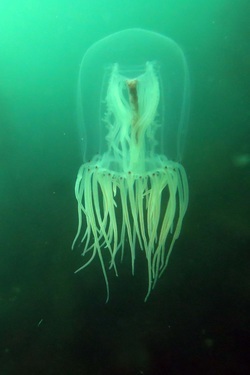 Red-eye medusas found in the near-shore waters around Calvert Island. Photos by Jenn Burt (left), Rosie Child (top middle), Kyle Armstrong (bottom middle), and Nathaniel Glickman (right). 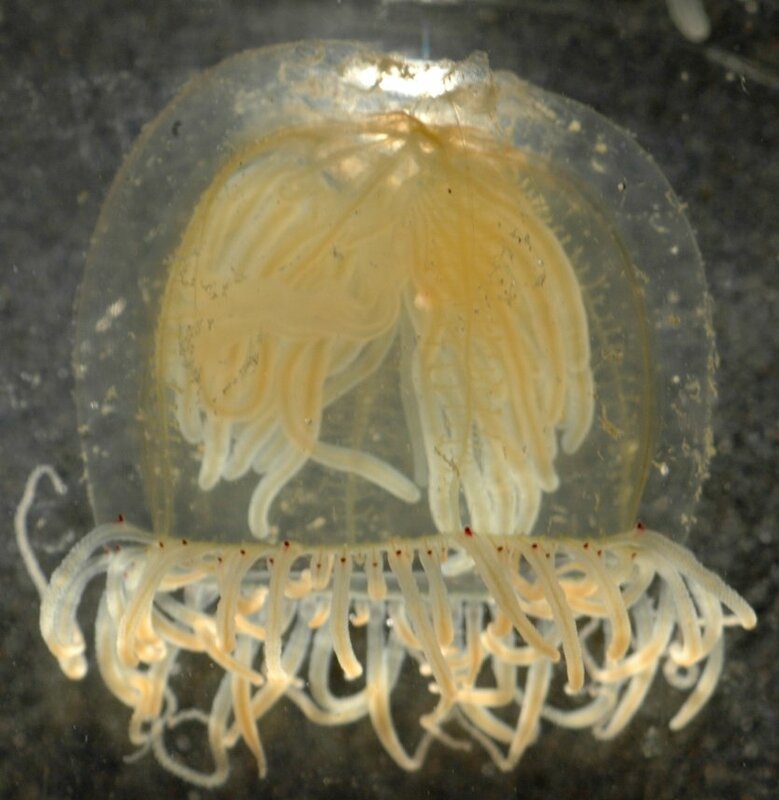 This small hydromedusa jelly has a narrow bell that reaches 4 cm tall. The margin of the bell is fringed with up to 120 tentacles that can expand to great lengths or contract to be shorter than the bell. This species may appear to be white or tinged with red or blue, but this is the result of ambient light. It is largely transparent with some white spots, and internal organs can be yellowish, brownish, reddish, or purplish. The eyespots (ocelli) for which it is named are ringed with red, and line the margin of the bell. This species appears to migrate towards the surface of the water at night, and towards the sea floor during the day. It is found in nearshore waters and bays along the coast from Alaska to northern Mexico. 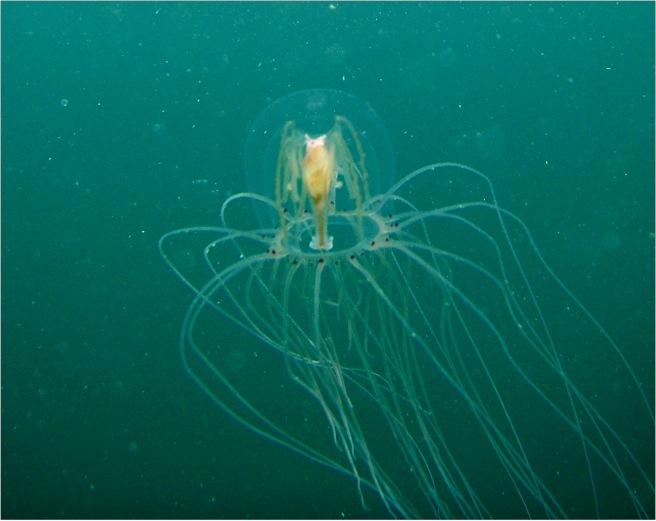 The blob-top jelly and tall-top jellies may appear similar, with coloured internal organs, tall bells, and many long tentacles. Both are lacking red eyes, and tall-top jellies have an extra protection at the top of their bell, which is transparent and so isn't always immediately visible. 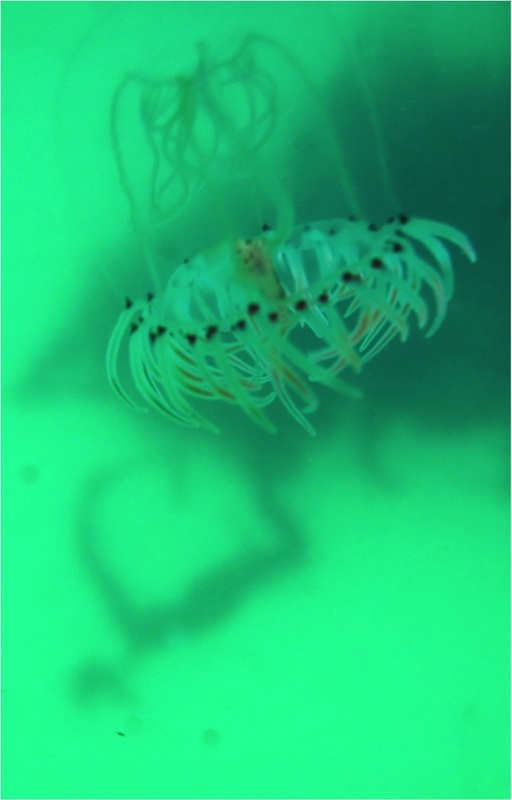 Red-eye medusae are collected for aquariums, neurobiological research, and for marine biology programs. The red eyespots are light sensitive, and help the jellyfish orient itself. 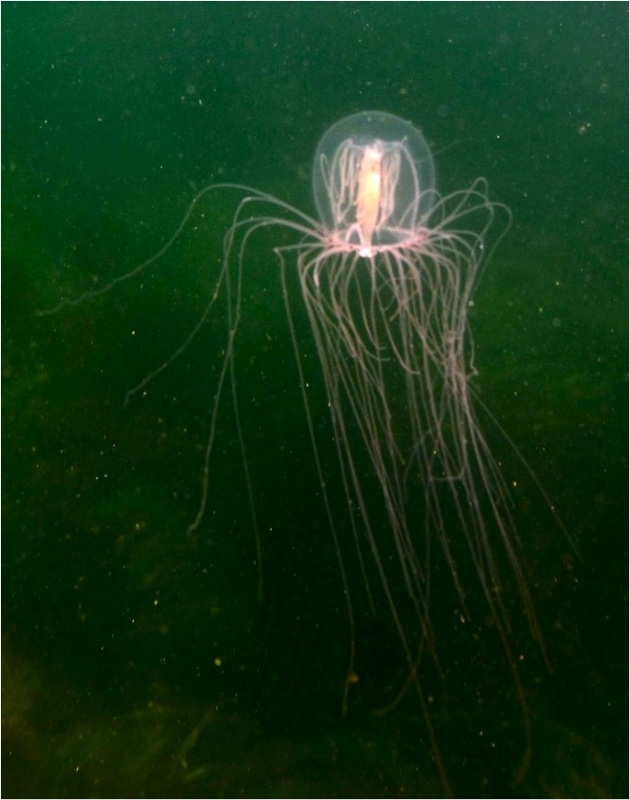 It feeds on benthic zooplankton during the day when it is closer to the seafloor, and will make "hopping" motions off the seafloor to stir up food; it will then drift downward, collecting food with its tentacles as it goes. It also eats small crustaceans and worms. 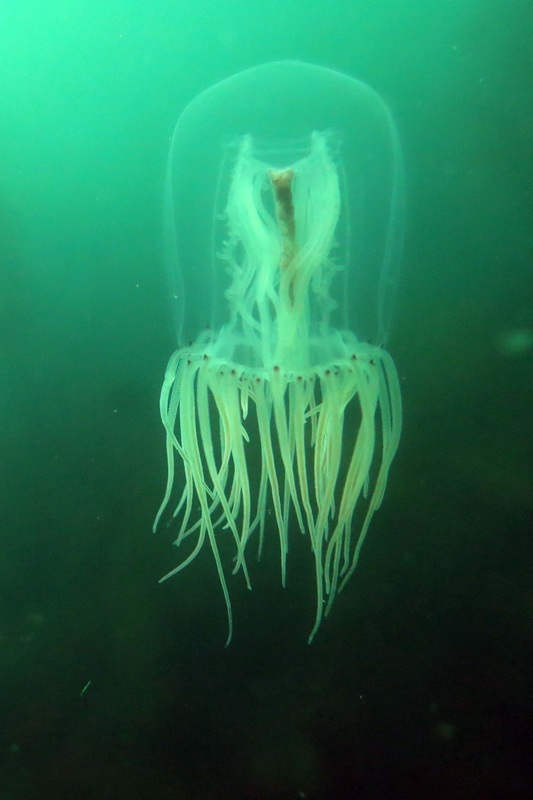 While many jellyfish species are increasing as a result of ocean warming, acidification, and and predator-prey imbalances, this species is on the decline. This may be the result of habitat destruction from seafloor dredging and pollution runoff, as well as collection for research. Cowles, D. (2006). Polyorchis penicillatus (Eschscholtz, 1829). Invertebrates of the Salish Sea. Rosario Beach Marine Laboratory. Accessed 06/08/2013. Harbo, R. M. (2011). Whelks to whales: Coastal marine life of the Pacific Northwest. Madeira Park, BC: Harbour Publishing. P. 67.